5 | 245 students enrolled. Certification in Online Financial Planning & Wealth Management course is jointly certified by NSE Academy & Elearnmarkets (NSE Academy is a subsidiary of National Stock Exchange of India). Finance Sector in India is emerging with a fast pace with the growing integration with World Markets. The Financial system is the mirror reflection of the country’s economy. Financial Planning and Wealth Management are the buzz words in the finance industry & is one of the most prestigious and well paid professions in the financial services sector. The Financial Advisors are the latest breed of professionals worldwide who through their own entrepreneurial practices or while working with banks/ investment advisory companies prepare financial plans for their clients and help them achieve their financial goals. This course helps you to understand your financial goals and assists you in growing, managing and protecting your wealth with its comprehensive course structure. This course jointly certified by NSE Academy & Elearnmarkets intends to help the participants acquire knowledge, skills, attitudes and values required to operate ethically and responsibly in the highly regulated financial services environment. This programme will also help the participants to respond to the challenges posed by the changing nature of the Financial Services Industry. Students here will be exposed to the important terms, rules, concepts, principles and theories related to financial planning & wealth management. It will also provide opportunities for students to apply academic skills practically in their personal life as well as in their career for their clients. This is one of the best financial planning & wealth management courses in India that will help you in learning about the process of creating wealth, the methods and instruments involved as well as managing wealth. Students enrolling for Certification in Online Financial Planning & Wealth Management program will be given a “Certificate of Completion” from NSE Academy, facilitated by Kredent Academy. The participants will also be given free access to related webinars conducted by Kredent Academy for further knowledge enhancement. The students can post all their queries in the discussion forum while pursuing the course. They would also be trained to do the financial planning calculations in MS-Excel. Also, they would be exposed to certain websites on mutual funds, insurance and the economy where they would be trained to extract and use data selectively for creating wealth. 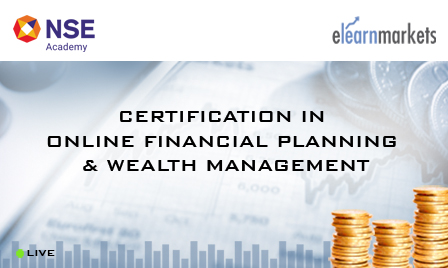 Under this course “Certification in Online Financial Planning & Wealth Management”, the participant will be required to appear for the online examination hosted on the website of Elearnmarkets.com. Please note that the participant will get the Certificate of Completion of NSE Academy Certified Financial Planning & Wealth Management after successfully clearing this examination.